A few weeks ago, my family and I headed down to the local farm to do our annual strawberry picking. We had a lot of fun, and brought home a big bunch of fresh, organic berries. In previous years, after about a week of daily berry eating, we all get sick of strawberries. 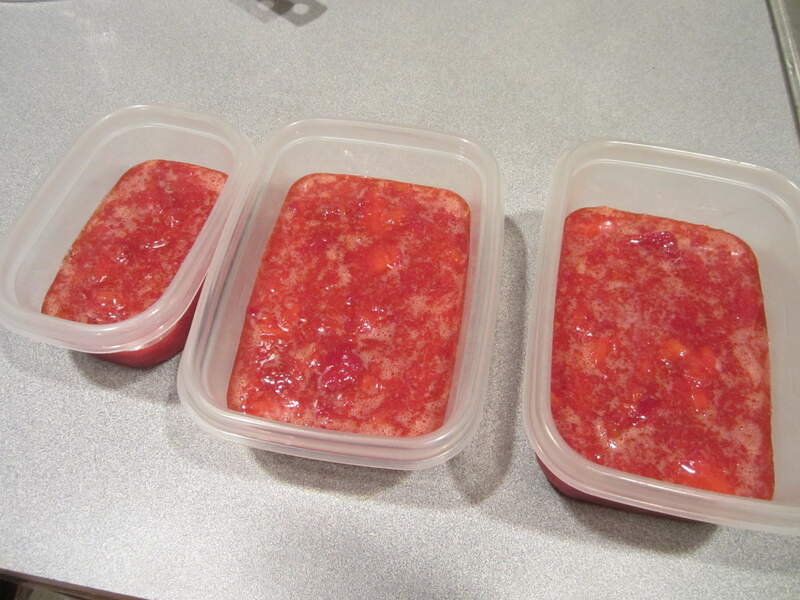 A friend told me that she makes freezer jam every year and that it’s the easiest thing in the world, so this year I decided to try my hand at it. Last fall, I found a bottle of instant pectin on sale at Target and bought it just for this occasion. 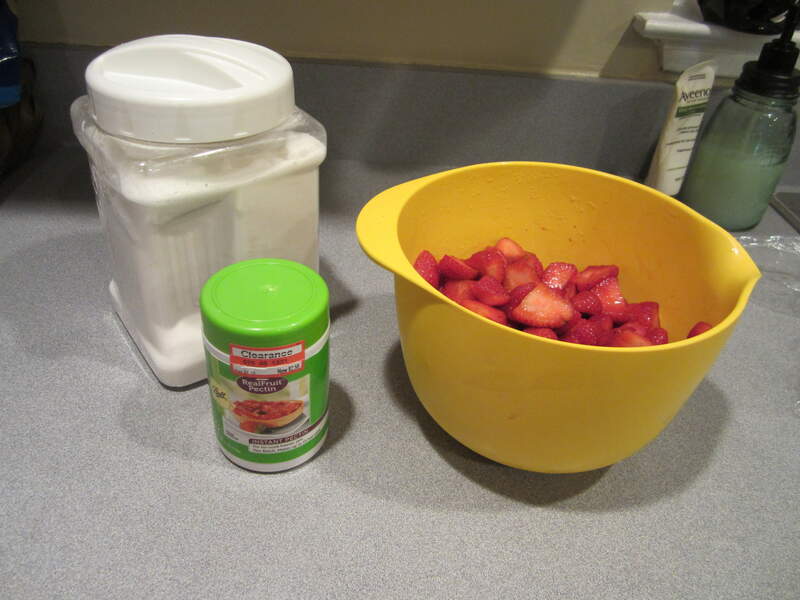 I gathered the sugar, pectin and the washed and trimmed berries and set to work. 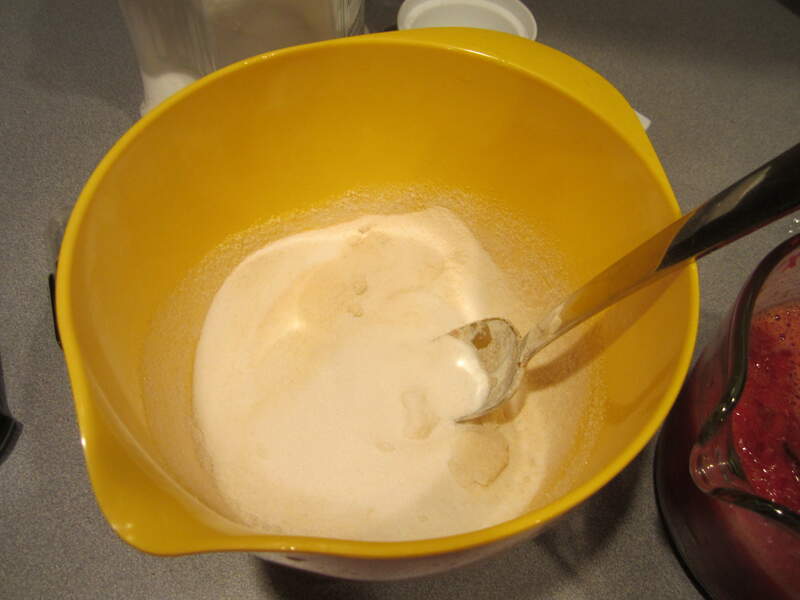 In a separate bowl, I mixed the sugar and pectin together. 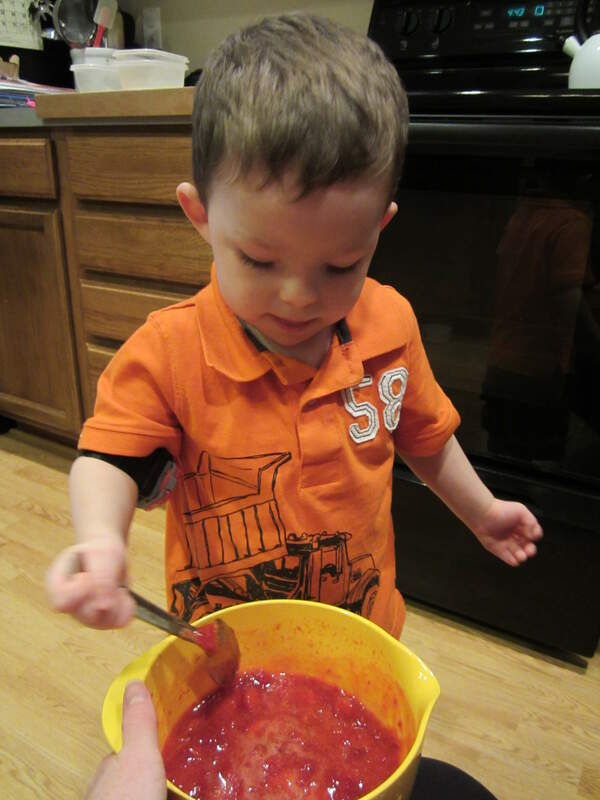 Next, we mixed the berries into the sugar/pectin mixture for 3 minutes. 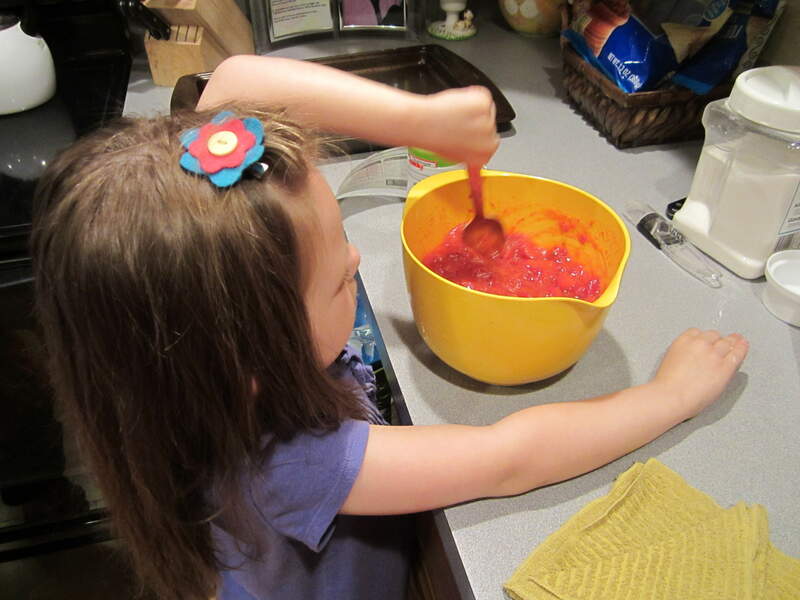 My daughter helped me do some of the stirring. I poured the jam into 3 containers and let them sit for the required 30 minutes before putting them in the freezer. I saved the little container for the refrigerator to use right away. The jam tasted wonderful, however, it never really set up into a thick jam. We still ate it up…and even used it on top of some vanilla ice cream, which was so good! Have you ever made freezer jam before? How did yours turn out? I have found that the freezer jam that I have made which you don’t boil the pectin does not set up as well as the other. I like Sure-Jell pectin it does set up better than the rest I have found. I recently used the Ball liquid pectin and it was a runny set but we still ate it. It also worked good to flavor our plain yogurt. 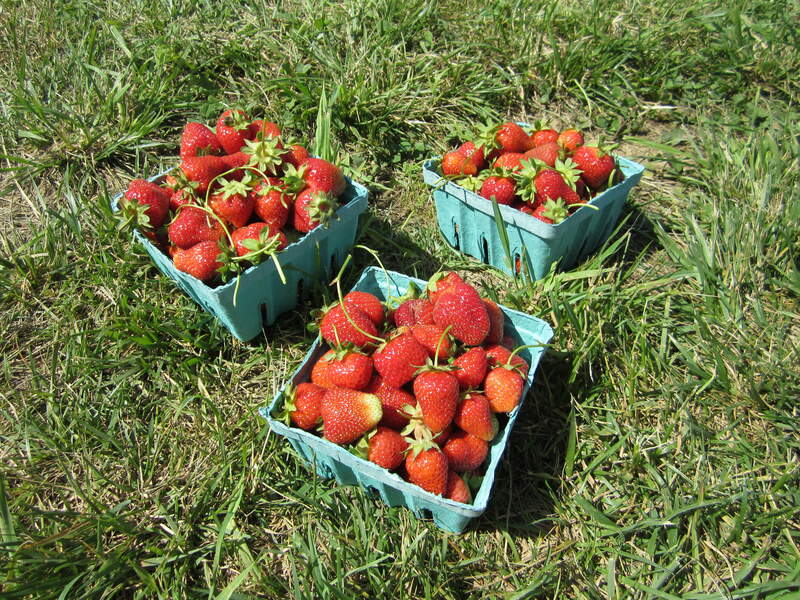 Our strawberry season is just starting here. We have a bunch of green strawberries on our plants. I am hoping we get more this year. Last year the slugs ate quite of few of our berries. That strawberry jam looks delicious! My 5yo. loves jelly sandwiches (no peanut butter), and this sounds like something he’d enjoy. Hi already 🙂 I checked my recipe and I used 1.5 cups of sugar to 4 cups crushed strawberries (which was 3 one-lb containers of berries). And I used Ball freezer jam pectin. Maybe strawberry amount is the diff? 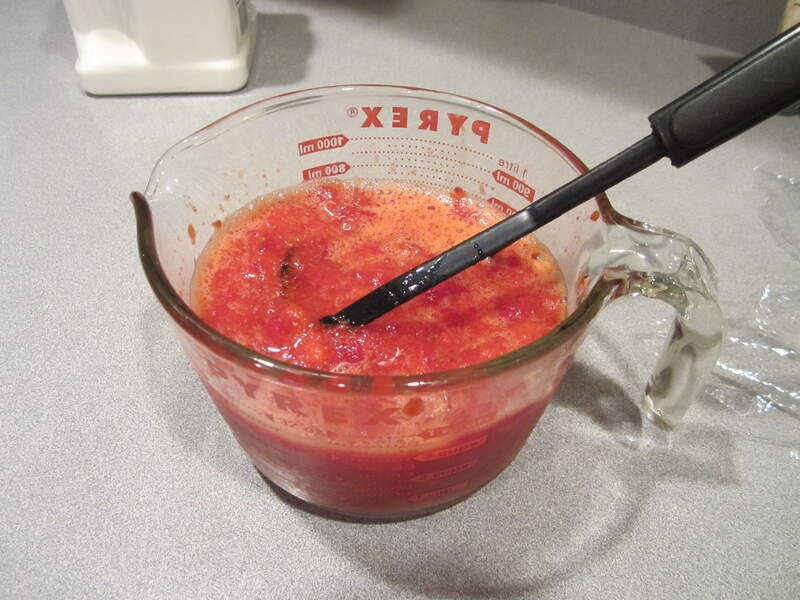 I think it’s like Shelly said…I needed to use the old-fashioned pectin that you cook. The instant pectin didn’t really do anything at all.